She LOVES giving hugs to anyone, to me, her daddy, her sissy and even the dog. She is a big hugger. 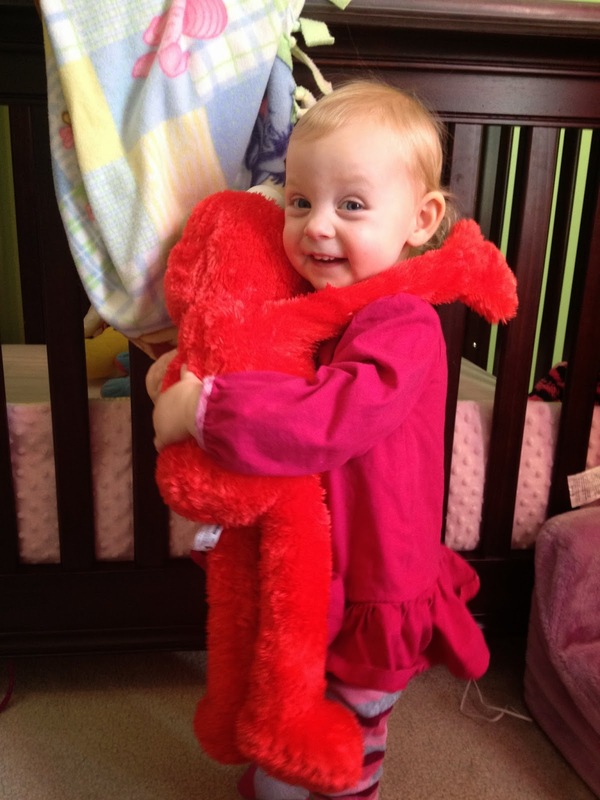 The fact that Elmo actually gives her hugs back got her hooked. I was a little nervous because the arms seem to be just mechanics covered by fur, and was afraid that it may break easily (my children are not always gentle with their toys!) As the days went on though, I realized that this Elmo is pretty sturdy. Lilly likes to try to sit on his lap and nothing bad has happened to the arms. 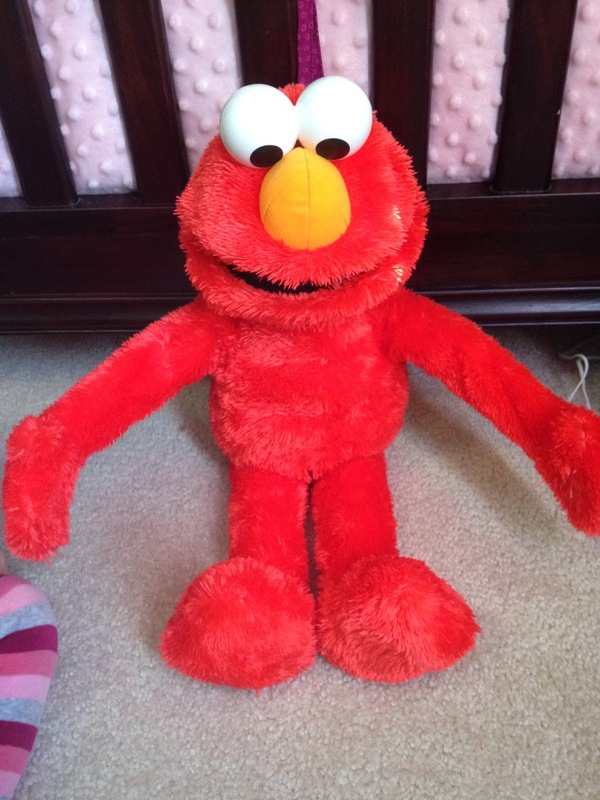 Elmo has two mode: Play and Sleep. The play mode has Elmo being upbeat and singing fun songs. If you carry him upside down he'll laugh at first and then ask to be held correctly, and acknowledges when you do. He says "I love you" lots which my daughter seems to love. When he talks, his mouth opens wide, which apparently makes it fun to put your hand in and feel Elmo talking. I see both Lilly and Ashley doing this. 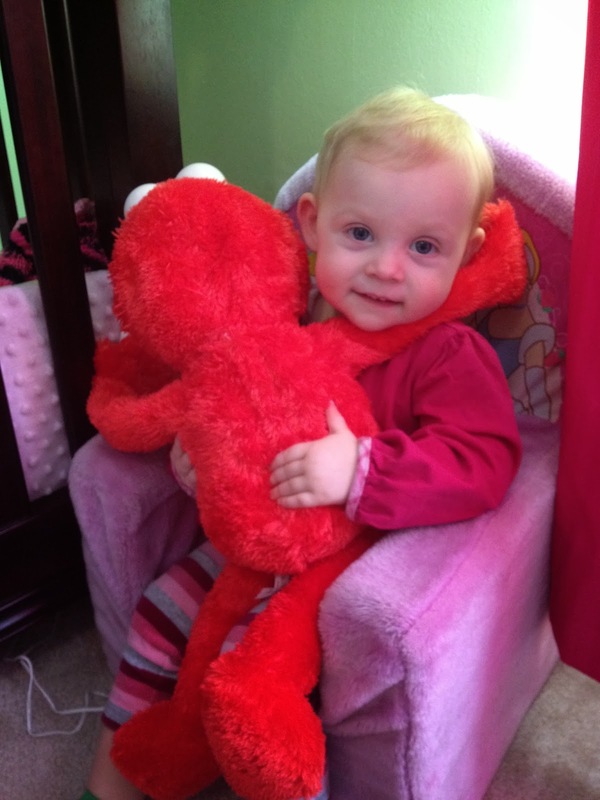 Even Ashley, at 5 years old, likes to play with this Elmo! This is such a great idea because the sleep mode actually plays lullaby music and has Elmo yawning and snoring a lot. He is very soft and tells Lilly that he is tired and wants to go to sleep! As you see in the picture, she put him to sleep! 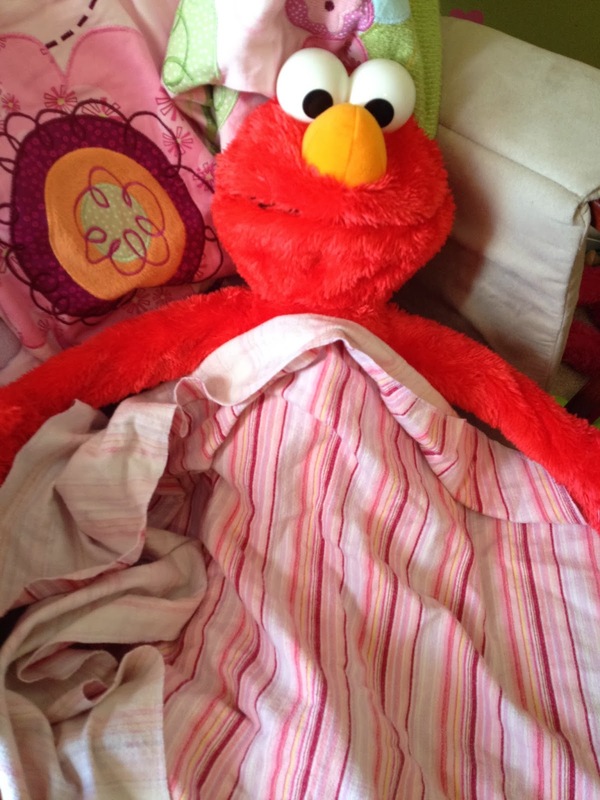 I haven't put Elmo in bed with her because, although he plays lullabies and talks softly, I'm sure she will just want to play with him, instead of sleep. I think this is a great toy and would recommend it to any parent of a child from ages 1-5. The little ones love how it is their size and the fact that it hugs and talks back is so fun! It really is a family toy, as everyone enjoys playing with him! The perk for me is, the more time Lilly plays with Elmo, and is entertained by him, the more crochet stitches I can complete!